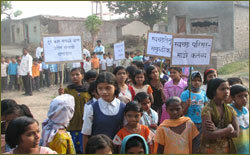 Neelvasant Foundation aims to develop the tribal & rural India. With this focus the foundation has taken 2 rural & 3 tribal villages under the Village adaptation Program for its overall development. As a first step every village is screened and observed in the basic survey to identify its needs and deficiencies. And thus the master plan for every village is designed respectively. 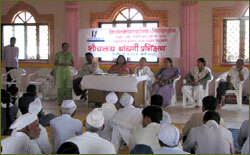 The following issues are the few highlights of accomplished & ongoing programs in these villages. 3 days sanitation awareness program in the village including children, women, youth, adult, old age in which the awareness program for personal hygiene, guidance for the house hold waste disposal for all the houses of village. 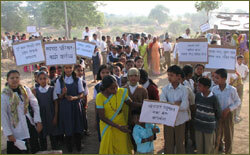 This awareness program followed by the live illustration of Lavetry for each house i.e. “Sopa Sandas” with the technical guidance from the experts of ‘Nirmal Gram Nirman Kendra’. 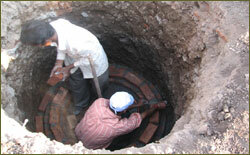 This program helps to build the mind setup of the villagers for using the close sanitation. 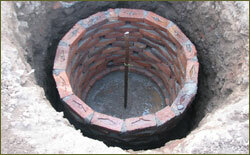 The foundation supplied a scheme to build the sanitation (Sopa Sandas) for the beneficiaries. This scheme is carried out with the participation of just 2000/- from beneficiaries, the Grampanchayat supplied with the River Sand. With this contribution the foundation built 70 lavetry in Karsul gaon and 24 in Oney gaon .This program is in continuation in the other Adopted villages also. The villages are introduced with the system of waste management for the village and also to have a good out come from the waste, in the view of environment conservation, and preventing health disasters from the dirty surrounding. The system involves the dry waste collection differently and also wet waste disposal system of decomposition (Gandul khat) Earth worm project etc. For the portable water the hand pump water testing service is given free to the villages. The villagers who experience draught in the summer especially tribal village i.e. Kalamuste is provided with portable water tanker service to all the four pada’s. After the portable water availability the NGO aims to have small filtration plant at the villages in future. Housing is the special scheme for the Single Women neglected by the society, disable persons below poverty line. Agriculture guidance workshops are taken by the expert faculty for different crops management, soil fertility and advance instrumentation. For the better yield and maximum profit to the farmers the proper guidance is helpful. Vocational Training, Guidance for small scale Household production & marketing especially for women. For the retired old people recreational activity with self independency is initiated by introducing the work on ‘Charkha’ with a meaningful Gandhiji’s motives. In this program the old villagers are benefited by self weaved cotton cloth for self ware. The tribal heritage of making crafts from the available local resources is maintained and encouraged by making the market available to them. The cultural activities like celebrating particular festival is appreciated by giving attractive incentives and involving them in the mass cultural events in the metro cities. The resources of different old technical Equipments, Dress, and Utensils, Natural stones, different type of woods, used in particular region will be attempted to conserve by the foundation in the Museum. The natural medicinal valued plants, trees will be supported by encouraging various Nurseries which in returns will give employment to the tribal people.